We love breakfast casseroles at our house and this Breakfast Casserole with Sausage and Hashbrowns one is our favorite recipes! This casserole is packed with veggies and breakfast meats along with eggs and potatoes, and of course CHEESE! This all comes together to have an explosion in every bite. The best thing about breakfast casseroles is you can make them ahead of time and cook them when you are ready. 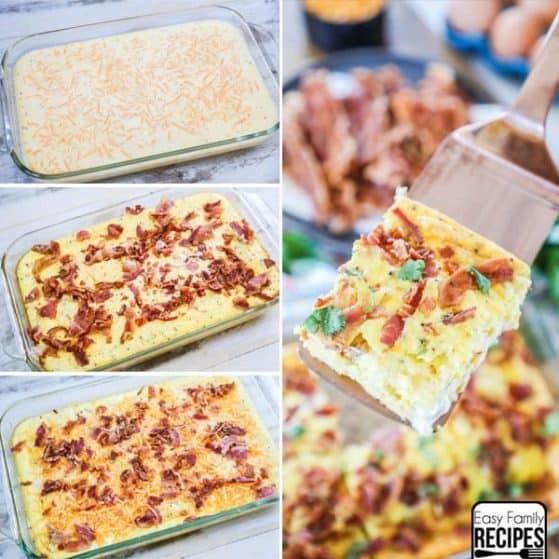 Breakfast casserole is a breakfast staple for Christmas and Easter, but also a great way to batch cook and have a hot breakfast ready to go at a moments notice! 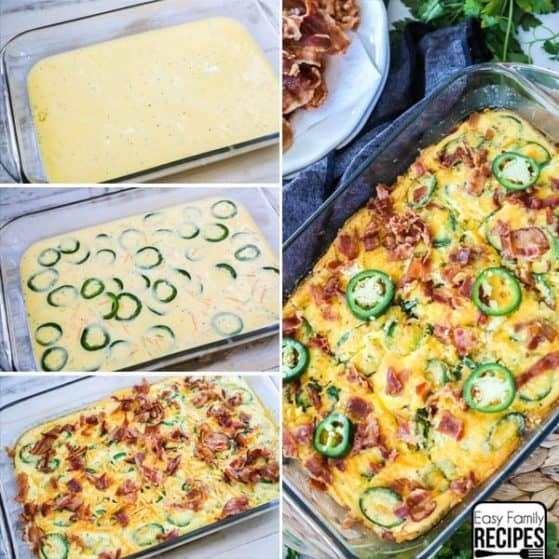 This recipe for breakfast casserole isn’t plain and boring, it is loaded with tons of flavors! There are two kinds of meats, two kinds or cheese, and lots of veggies! 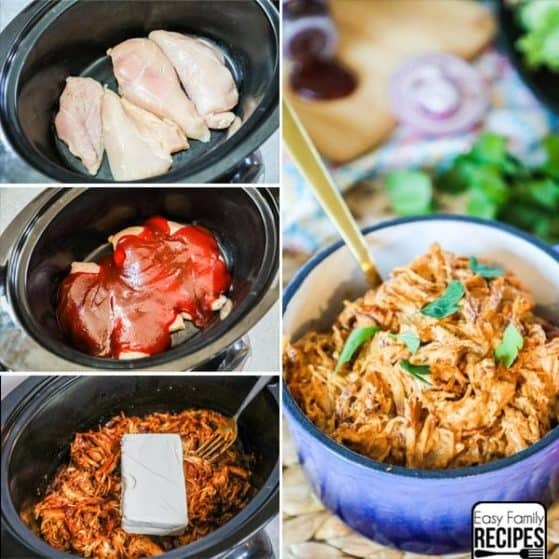 It is also adaptable if you have other meats and veggies that you would like to add. 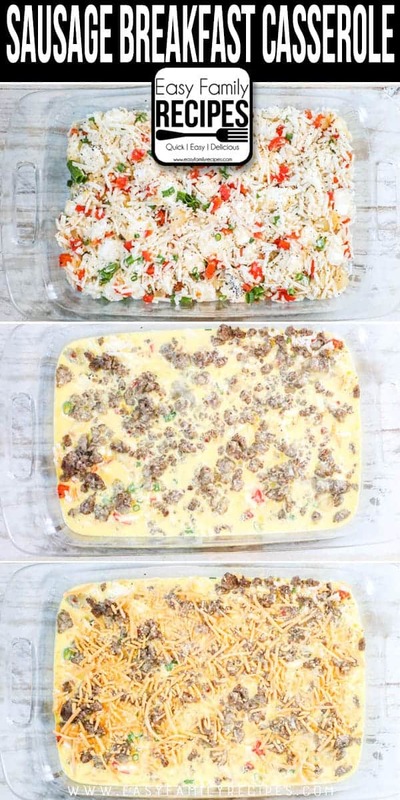 By prepping and freezing this Breakfast Casserole with Sausage and Hashbrowns recipe (directions below,) you are able to have a homemade breakfast in just minutes, even on the busiest days of the week. 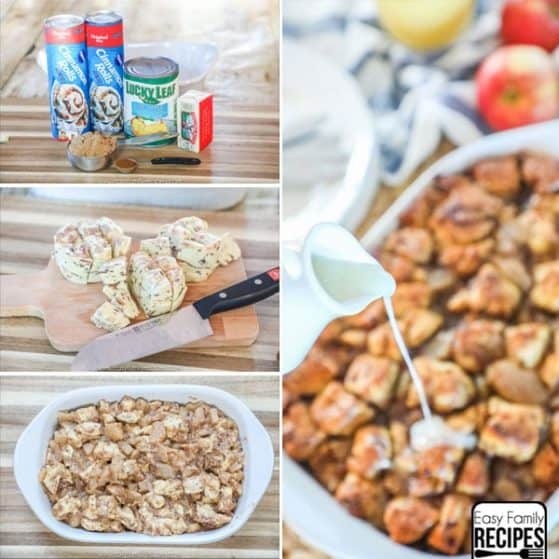 If you are looking for more breakfast inspiration, make sure to check out my apple fritter breakfast casserole, sausage breakfast casserole, and green chile egg casserole for a fun twist on the morning meal! 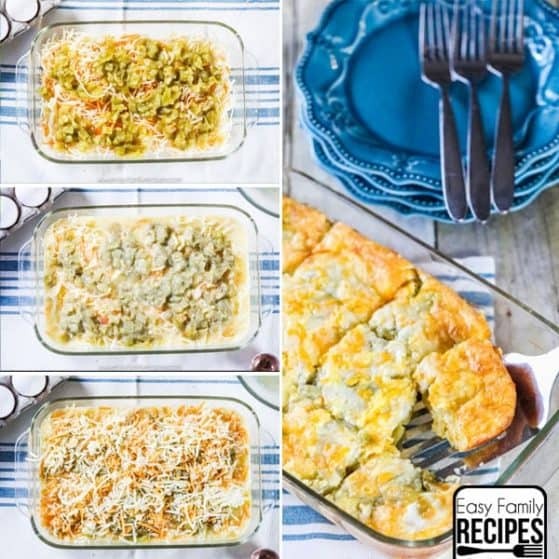 This breakfast casserole is delicious by itself because it is loaded with flavors but I will share a few of our favorite sides. You can serve it with anything you feel like. Those are just a few of our favorites in the morning. If you have any additional sides please comment below, I love to hear from my readers. This Breakfast Casserole with Sausage and Hashbrowns is super easy to put together. And the best part is you can put it together and freeze it or put it in the refrigerator to cook later. First you sautés the pepper and the onions. If you don’t like peppers you don’t have to put them in the recipe. 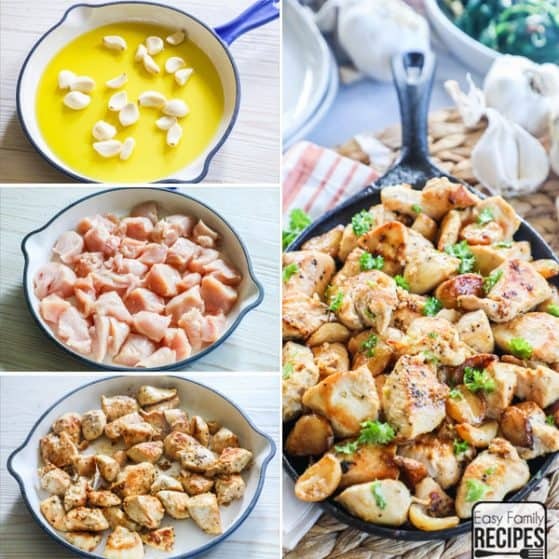 You can also add other veggies that you may really like! Next, in a large bowl place the hashbrowns, onions, peppers, green onions, salt, garlic, and pepper together. You can use either shredded or cubed hashbrowns, both work well, but I tend to use the shredded hashbrowns. 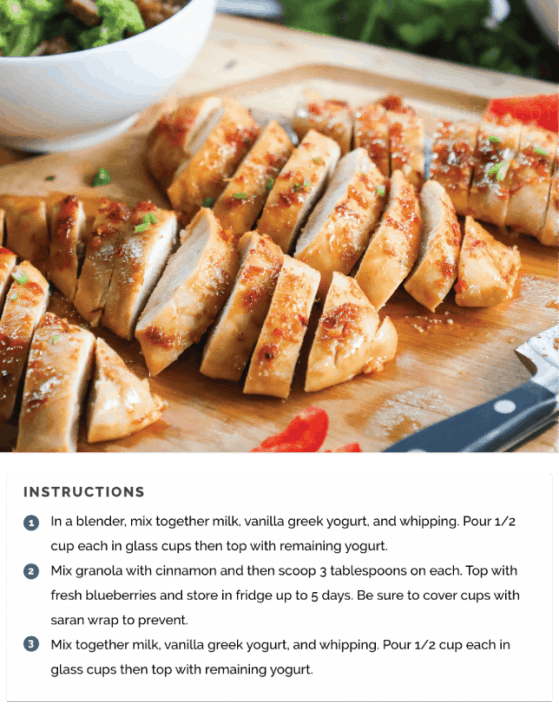 Fold in the cream cheese cubes and don’t mix too much. 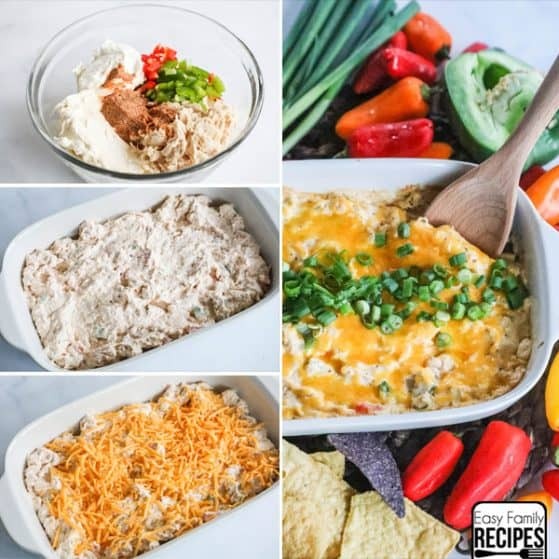 We want the cream cheese to stay in cubes so that you get nice creamy bites when the casserole is baked. Spread the mixture in a large casserole dish. Sprinkle the crumbled sausage on top. Whisk together the eggs, cream, salt and pepper. Pour over hashbrown mixture. Sprinkle cheese on top and bake. After 35 minutes, remove the casserole from the oven and add the crumbled bacon. Finish baking for another 10-20 minutes! Can this Breakfast Casserole be Made the Night Before? Yes, this can be an overnight breakfast casserole. To make the breakfast casserole the night before, assemble the casserole through step 4 on the recipe below. Cover tightly and refrigerate overnight. In the morning bake as directed, adding 10-20 minutes to the first part cook time since the casserole will be cold. Then continue as instructed. Is this Breakfast Casserole with Sausage and Hashbrowns Gluten Free? Yes, this is a gluten free dish. One thing to remember is to check all labels when buying your food to ensure you have purchased gluten free items. Can I use Milk in place of Cream? Yes you can. I prefer the Breakfast Casserole with Sausage and Hashbrowns recipe with cream, but it will also work with half and half or milk. 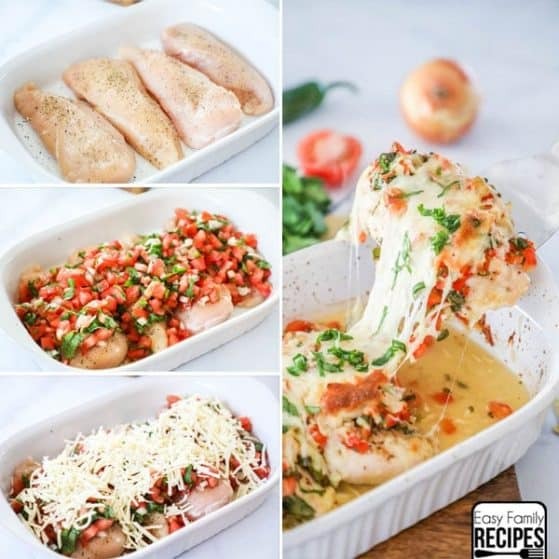 Your dish may not be as creamy when serving but the recipe will still come out well! 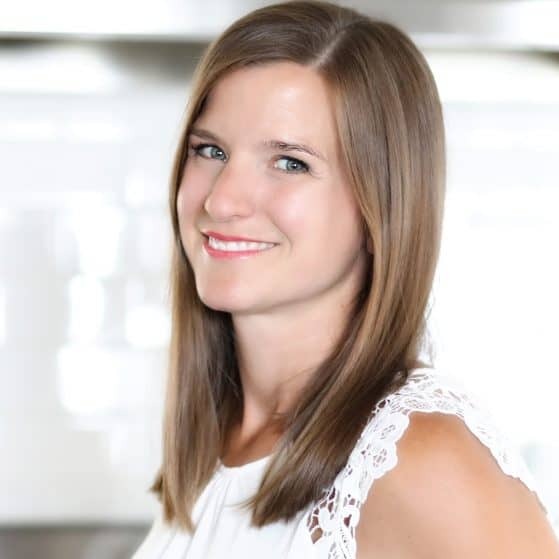 Can I use fresh potatoes in place of frozen potatoes? You can but you may find the fresh potatoes have a little more moisture in them. I also use frozen hashbrowns because they are easy and convenient. Can I freeze this Breakfast Casserole with Sausage and Hashbrowns? This breakfast casserole can be refrigerated or frozen and reheats well! To freeze the casserole, cut the breakfast casserole into serving sized portions. Place each piece in an airtight container or zip top bag. Place in the freezer for up to 1 month. When you are ready to reheat, remove the breakfast casserole from the packaging and place on a microwave safe plate. Microwave for 1 minute, then 30 second increments until heated through. 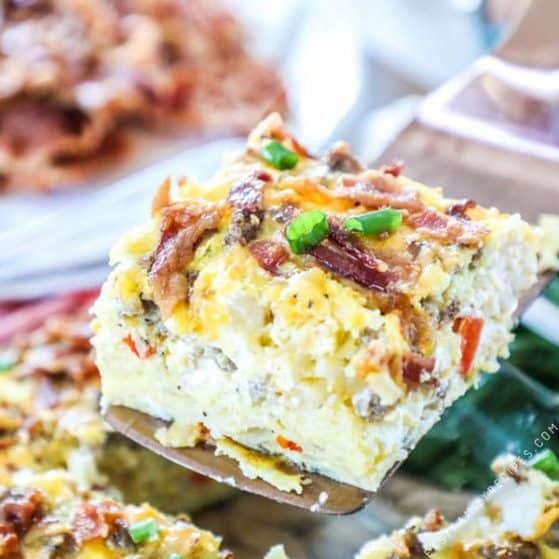 I really hope you enjoy this Loaded Breakfast Casserole as much as we do in our home. 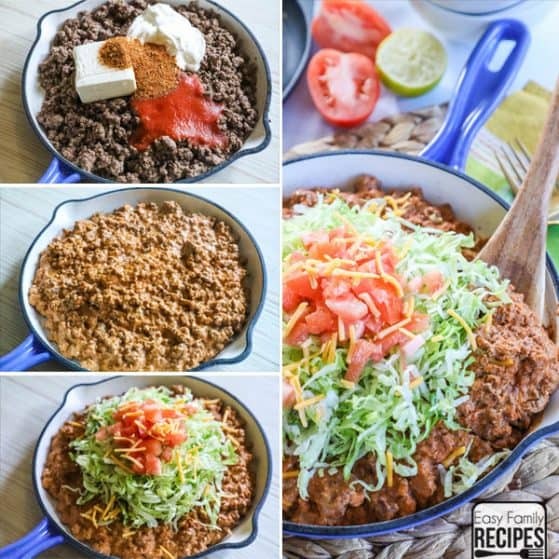 This casserole is full of flavor and is super easy to make. 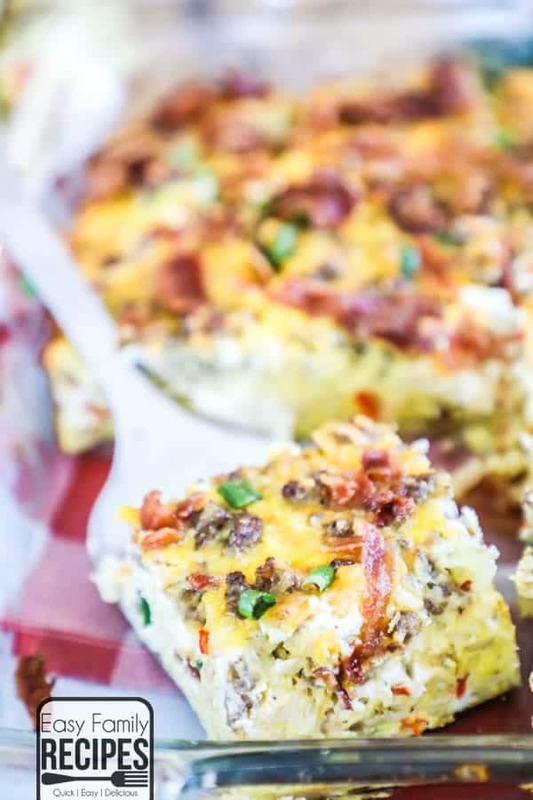 Loaded Breakfast Casserole has all your breakfast favorites in one delicious casserole. Sauté the onion and bell pepper in the butter over medium heat until soft. In a large bowl, mix the hashbrowns, sausage, onions, peppers, green onions, salt, pepper, garlic, and cream cheese until everything is evenly distributed. Then spread mixture in a greased 9x13" casserole dish and sprinkle the sausage over the top of mixture. Then whisk together the eggs, heavy cream, salt and pepper. Pour over the hashbrowns. Sprinkle the cheddar cheese on top. Bake for 35 minutes, then remove from oven and top the casserole with the bacon crumbles, and return to finish baking 10-20 minutes or until the center springs back when you touched. To make this ahead of time, assemble casserole as directed except for bacon crumbles. Cover with cling wrap and refrigerate until ready to bake. Bake as directed, except time will increase about 10-15 minutes total starting from cold. 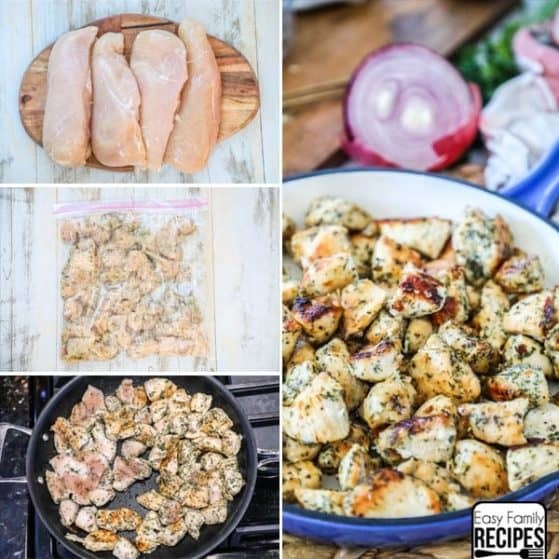 For more great easy dinner inspiration,sign up for our emails here! What kind of sausage did you use? I don’t see it in the ingredients list. Oh my goodness! I don’t know how I left that out of the list lol! I updated the recipe so you should see it now. It is just regular pork sausage and I usually use Jimmy Dean. Thanks for letting me know!